Sunday was a busy day in Saint Bartholomew’s Church, Ballsbridge, with an early morning Said Eucharist and the Sung Eucharist in the morning, and Solemn Evensong and Benediction in the evening. In between these busy hours, there was some quiet time to go for cups of coffee in Ballsbridge, to walk around Ballsbridge and Baggot Street, for a return walk to the city centre, and for a short walk along the banks of the Grand Canal. Parsons bookshop on Baggot Street Bridge over the Grand Canal was once a great landmark institution in this part of Dublin, while Waterloo House was once one of the favourite pubs of Patrick Kavanagh, who lived nearby for many years, on Pembroke Road and on Raglan Road. Baggot Street takes its name from the Baggot family and Baggotrath Castle, or Baggotsrath Castle, a mediaeval castle they built in the late 13th century on a site somewhere on present-day Baggot Street. The castle and surrounding district and streets take their names from Sir Robert Bagod, the Chief Justice of the Irish Common Pleas, who acquired the Manor of Rath and its lands about 1280 and built the castle. By 1379, the castle was owned by William Fitzwilliam, ancestor of the Viscounts Fitzwilliam. It then passed to the influential English-born soldier and statesman Sir Edward Perrers in the early 15th century, but later reverted to the Fitzwilliam family. When Sir Edward’s only son died in 1428, the castle passed to his widowed mother Joanna, and when she died in 1441 she named James Cornwalsh, the Chief Baron of the Irish Exchequer, as her executor. Cornwalsh took possession of the castle, but he was challenged by Sir Edward’s daughter Ismay who had married into the Fitzwilliam family. Her husband, William Fitzwilliam, raised a substantial troop of soldiers, attacked the castle, and ‘feloniously murdered’ the judge. William and his wife Ismay were soon pardoned. But, a generation later, the castle was described as in a ruinous condition in 1489. The castle was rebuilt in the decades that followed, and Baggotrath Castle remained the seat of the Fitzwilliam family until Sir Thomas Fitzwilliam moved to Merrion Castle around 1550. By the 1640s, it was said to be the strongest fortress near Dublin, although the Fitzwilliam family complained of substantial damage to their property in 1642. In July 1649, the Irish royalist leader, James Butler, 1st Duke of Ormonde, advanced on Dublin and the Parliamentary forces commanded by Colonel Michael Jones. Jones anticipated that Ormonde would try to seize Baggotrath Castle, and partly destroyed it. Ormonde was still determined to fortify the castle and on 1 August sent a troop of 1,500 men was to secure it. But they took the whole night to travel a distance of about a mile, and by the time Ormonde arrived on the scene nothing had been done to fortify the castle. Jones then attacked the castle with 5,000 men, the royalist cavalry were scattered and most of the foot soldiers were killed or captured. Jones then moved on to his decisive victory at the Battle of Rathmines. The Fitzwilliam family seems to have made no efforts to restore Baggotrath Castle, although the area around the castle and its lands became the nucleus of the great Fitzwilliam and Pembroke estate in this part of Dublin. The castle was abandoned, and fell into total ruin in the early 1700s. John Rocque’s map of Dublin in 1757, showing Baggotrath, Simmonscourt and Donnybrook, places Baggotrath Castle on the ‘Gallows Road,’ running from Saint Stephen’s Green to Ballsbridge. The street was called Baggot Street in 1773, and continued on into Pembroke Road. 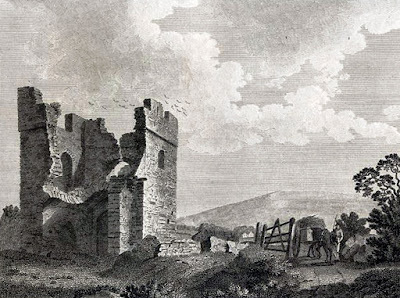 The ruins of Baggotrath Castle were visited by Austin Cooper in 1778 and described by him in detail by Austin Cooper. They were drawn by Francis Gosse in 1792, some years before the castle was demolished to allow for the extension of Baggot Street. Lower Baggot Street is mainly Georgian, while Upper Baggot Street is mostly Victorian in architectural style. The last surviving ruins of the castle were razed to the ground 200 years ago by Dublin Corporation, sometime around 1821-1842, as the area around the Grand Canal was being developed. Some years later, a royal triumphal archway was built at Baggot Street Bridge over the Grand Canal for Queen Victoria’s visit to Dublin in 1849. There is nothing to mark the site today, and local historians argue over the location of the original castle site. Rocque’s map of Dublin places Baggotrath Castle on Pembroke Road area, further east than Baggot Street Upper. But this may not be totally accurate. Peter Harbison (1998) says it stood on what is now the part of Upper Baggot Street facing Waterloo Road. Wikipedia is more specific, but does not substantiate its claim that the castle stood at the present 44-46 Upper Baggot Street, facing Waterloo Road. Near what must have been the site of the castle on Upper Baggot Street, the Royal City of Dublin Hospital dates from 1832. It is still in use as community hospital and is popularly known as Baggot Street Hospital. The coat-of-arms over the doorway is not a royal emblem by the heraldic bearing of the Herbert family, Earls of Pembroke, who have their names to many of the surrounding streets. On the opposite side of the street, on the corner of Upper Baggot Street and Waterloo Road, once stood the Episcopal Chapel, a striking building opened in 1835. It had seating for 1,200 and an attached ‘Asylum for Penitential Women.’ The first chaplain was Canon Hamilton Verschoyle, later Dean of Ferns and Bishop of Kilmore. In 1886, the chapel was assigned parochial district carved out of Saint Peter’s Parish. But the chapel closed in 1923, and the short-lived parish was divided between Saint Bartholomew’s Church, Ballsbridge, Christ Church, Leeson Park, and Saint Stephen’s Church, Mount Street. The chapel was bought by the Diocese of Dublin and was used as a diocesan hall until it closed in 1945. It has since been replaced by a modern office block. The memory of the castle is preserved in name of Baggotrath Lane, a narrow side street off Lower Baggot Street. As for the Baggot or Bagod family, the Bagot family has held land in Staffordshire since the 11th century, with their estates centred on Blithfield Hall, near Abbot’s Bromely, outside Rugeley. Sir Hervey Bagot of Blithfield Hall was an MP Staffordshire and High Sheriff of Staffordshire (1626-1627), and was made a baronet. Later, he fought as a Royalist in the Civil War. The sixth baronet was made Lord Bagot in 1780, and the titles and part of the ancestral estates remain in the family.